Have you converted your nature strip turf into a footpath garden? This is a call on gardeners to send me a photograph showing how you have put the nature back into your nature strip. A short sentence (or two) explaining what footpath gardening means to you would add value to your image. I can add brief comments as image captions. Until the law changes, images will be published anonymously to protect you from prosecution by Brisbane City Council. You never know, this may become a television gardening story! I want to create the first public gallery of how people cultivate this little strip of public land outside their home. Brisbane City Council has flagged a review of the section of its Natural Assets Local Law (NALL, 2003) which forbids the cultivation of nature strips by ratepayers. Over the past decade, many dedicated gardeners have cultivated the footpaths outside their homes in contravention of the NALL only to find themselves being criminalised by Brisbane City Council and threatened by heavy fines if they fail to re-turf their work within arbitrary deadlines. 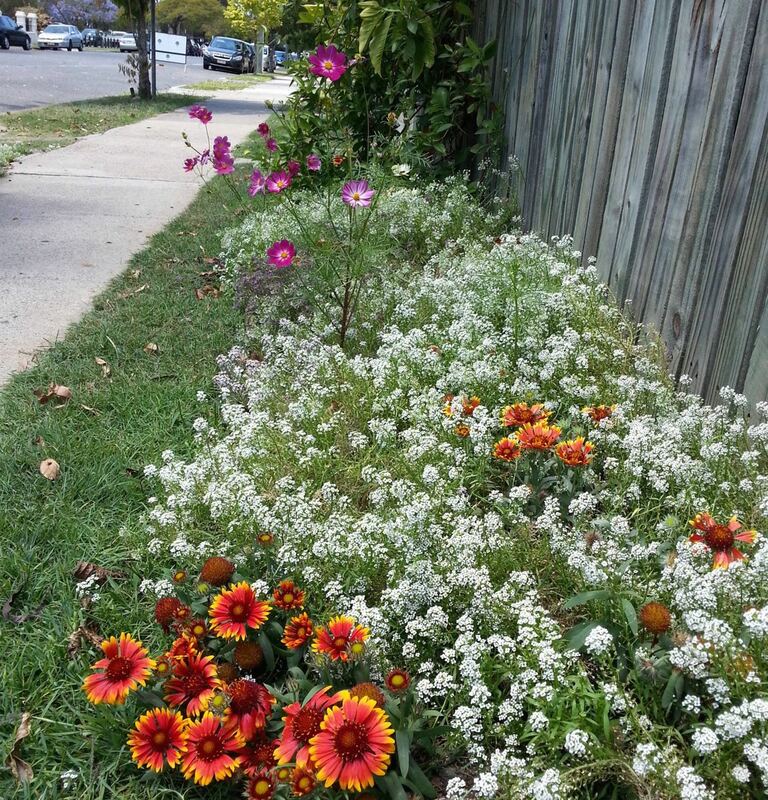 In some cases, Brisbane City Council has negotiated settlements allowing footpath gardens to continue with modifications, such as the verge garden in Wynnum West. Supporters of the elderly couple responsible for this garden were ready to picket councillors, so this was a step in the right direction for BCC. If you want to garden on your verge, visit my blog ‘To Boldly Garden Where No One Has Gardened Before‘. What is the result of footpath gardening? Much research points to increased sale prices of property – a pretty front garden and nature strip can add up to 10% of the value of your home and it helps property sell faster. Real estate agents like the concept. A study involving the Community Greening project by the NSW Department of Public Housing and the NSW Police found that streets where people actively garden in public experience a drop in petty crime, like theft, vandalism and graffiti. Pretty much every study completed around the world agrees that the social benefits of gardening on public land are a sustained boost in well-being of the gardeners and a greater sense of community through meeting and socialising with neighbours. It’s grass roots community building. Gardening on public open space is not a party political issue. Instead of heavily fining public-spirited rate paying gardeners, these councils developed regulations that included them. I administered provisions that ensured lawn mowing, weed control, tree maintenance and road maintenance services and contractors worked with footpath gardeners, not against them. Good on Brisbane’s ratepayers for taking a stand against stupid, municipal red tape that has for too long blocked people from realising the full value of their homes, frustrated the desire to beautify our city by putting land to better use – and opposing our natural desire to behave like a social species. How do I garden on my verge? Read: ‘To Boldly Garden Where No One Has Gardened Before’. Brisbane City Council uses a range of native plants in its verge gardens. Lomandra ‘Tanika’ is an excellent choice. Footpath gardens are great places for growing native plants. Filming for Gardening Australia. This Brisbane footpath garden has been cultivated by the same owners since the 1960’s. Do you know of any older? This Brisbane footpath garden has been cultivated by the same owners since the 1960’s. Do you know of any older? Mum’s criminal garden: Brisbane City Council’s Natural Assets Local Law ( 2003), makes it illegal to voluntarily garden on footpaths. Gardeners demand change to this law. “The verge garden is the natural habitat of the white picket fence”, Jerry Coleby-Williams, 5th November 2015. Verge gardens enhance property values. English box completes the picture. Posties view: Debra’s footpath garden. Debra’s footpath and garden merge seamlessly. Gardeners were encouraged to cultivate tree bases in the ‘Brighter Borough’ campaign, an initiative of Wandsworth Borough Council when I worked with them (London, 1980’s). Annuals and fragrant frangipani: “Starting small to avoid retribution”. Aromatic plants enliven a walk. Planted for reliable, durable charm. “Vandal-proof but pretty” – a subtropical cottage verge planted by Paula and her grand daughter. I hope that you’ll offer an ‘anonymous’ option for residents who are still living in trepidation of those ludicrous fines. It’s amazing how long the echoes of authoritarianism keep reverberating. A few years ago in Cleveland trying to get signatures on a petition to clean up Moreton Bay. The most common response from older Queenslanders (ie my age and above) was “will the government see my name?”. The first time I just thought it was individual paranoia, then when it happened again and again and again I realized what scars were left by Joh’s former police state. Brilliant concept Jerry, if my health keeps up I will look at my nature strips, either side of the driveway. I am having some paving done so will wait until thats done. Sweet potato appeals to me, I lived in PNG for 25 yrs and know the plant well always as a food source rather than as decoration. I had a run in with the Brisbane City Council over 15 years ago, when I was living in Balmoral. I had a school and church near by and people always commented how lovely it all looked. Then a notice from the council: remove or be fined. I was furious and going to ring all the TV stations. In the end I rang and confronted the council. They allowed me my verge garden after I paid for a permit that is passed onto all future property owners. After all the heart ache the problem was cured! Good concept Jerry. I have emailed you a photo of my nature strip though I live in the neighbouring MBRC shire. Will get my BCC gardening mates to send you pics of their efforts. Thanks for taking up this cause Jerry. I knew that the council didn’t like the idea but I wasn’t aware of the incredible fines. My property has very large trees which the council protects. That’s great but it means I can’t get enough sun for edible plants. The solution has been to plant a herb garden in the one sunny place nearby, that’s right the footpath. Perfect. And if the neighbours want to help themselves that’s even better. It seems a much better option than having an over grown, weedy footpath. Hi Jerry, We live in Redlands and had no problems planting a garden on our footpath. I submitted a plan to the council which involved requesting them to remove the existing overgrown and disgusting mess. In its place, I showed how we would replace it with a cultivated and edged garden full of native trees and even a koala food mallee (as we are in a koala zone). it all went off very well, with a few negotiations to stop them cutting down the macadamia nut tree and to return me a bit of mulch from the trees they removed. I will hunt around for some photos from when it was in good nick! it needs a bit of a weed and re-mulch at present!!!!!!! Are you submitting a photo? Good to hear of your luck; many gardeners in your area have not had your experience. Hi Jerry, I am writing in response to your email “Footpath gardens that brighten Brisbane”. There are many beautifully kept footpath gardens Around my street and surrounding suburbs I have the pleasure of passing as I walk by. I would love the opportunity to show you these gardens and my own organic progression, “The Backyard Farm” in (you guessed it) my own backyard. I am also ridding my footpath garden of nutgrass and have layer organic matter and mulch ( as well as rid it of an unwanted tree) to attend to it when its ready for planting. I have an established veggie garden and hope to expand as time allows, and have been improving the soil of the already established gardens for planting! Soon to add chickens also. I invite you to come and check out and welcome your opinion’s and suggestions to aid in progression of my already established and much loved (organic) Backyard farm. I will also take this opportunity to thank you for everything you do for the gardening (and wider) community. At this stage I am looking for images of footpath gardens. So if you can contribute, that would be appreciated. I was wondering if there has been any changes by Brisbane City Council about their local laws relating to verge / nature strip guidelines. I have had a look around their website but couldn’t find any information apart from Council Street Trees and related policies. Great article.Thanks for sharing information.